The main draw at Le Castella is being able to witness the freshly baked Castella cakes being brought out from the back kitchen and cut in full view of the public eye every 10 to 15 minutes. Eager customers can feel free to snap photos of the amazing spectacle that is—the reveal of the moist and fluffy interior that oozes cheesy and eggy goodness once it is cut. The Original Castella cake (S$9.90) boasts a fluffy and moist texture that is further accentuated by a strong aroma of freshly cooked eggs. The outer crust possesses a mildly toasted flavour that we thought complemented the richness of the eggy interior well. 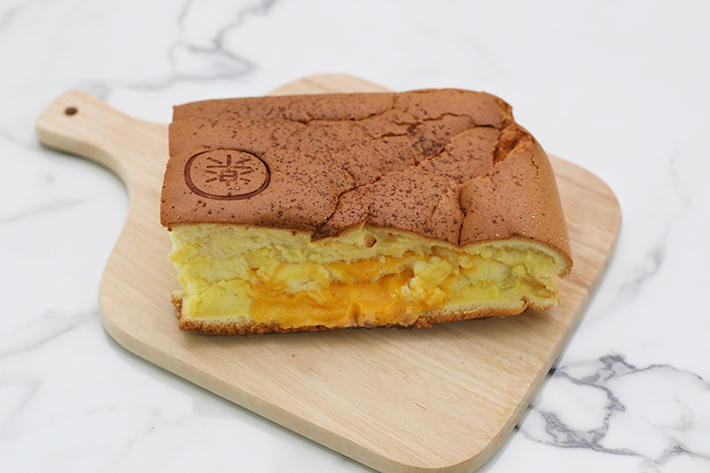 The Cheese Castella cake (S$11.90) on the other hand is exactly the same except for a thin layer of cheese that adds a subtle saltiness and richness to the cake. This is one you have to enjoy hot in order to fully savour the melted cheese. The overall taste is pretty similar to a steamed egg cake you would typically find in dim sum restaurants. It is light, moist and not overly sweet—this would probably go amazingly well with a cup of tea in the afternoon. Le Castella’s cakes—or Castella cakes in general—should be enjoyed fresh out of the oven when it is still warm and fluffy. The textural experience transcends all other cakes out there but you would have to try it for yourself to understand why. If you plan on getting your hands on these lovely bakes at Le Castella, we highly recommend that you begin queuing from 10.30am onwards. Each customer is only entitled to 2 boxes of Castella cakes per order. Read our Castella Cake Taste Test – Which is the best castella cake in Singapore?